Loosen the wheel bolts . Jack up the vehicle . Using the hexagonal socket in the screwdriver handle , unscrew the loosened wheel bolts, remove and place on a clean surface. If applicable, take note of the running direction of the tyre . Position the spare wheel / temporary spare wheel. Insert the anti-theft wheel bolt using the adapter at position or ③ and tighten it slightly in a clockwise direction. 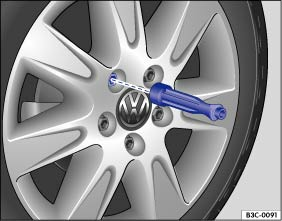 Screw in all the other wheel bolts in a clockwise direction and use the hexagonal socket in the screwdriver handle to tighten them gently. Use the box spanner to tighten all the wheel bolts securely in a clockwise direction . Do not tighten the bolts in clockwise or anti-clockwise sequence. Tighten them in diagonal sequence. Fit the cover caps, centre covers or wheel covers . An incorrect torque or incorrectly handled wheel bolts can lead to a loss of control over the vehicle, cause accidents and serious injuries. Always keep all wheel bolts and threads in the wheel hubs clean and free from oil and grease. The wheel bolts must be easy to turn and be tightened to the specified torque. The hexagonal socket in the screwdriver handle should be used for turning wheel bolts only. Do not use it to loosen or tighten the wheel bolts.